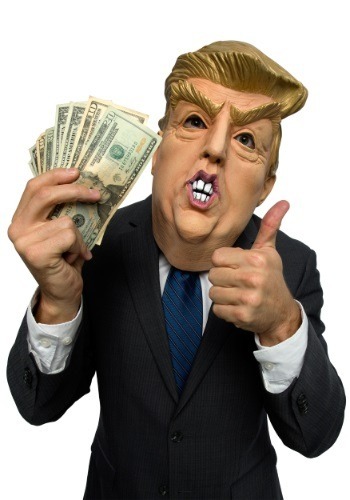 You'll experience so much winning when you wear this adult Donald mask. So much, in fact, you might even make yourself great again! We don't care if you're planning a new series in a reality television boardroom, whether you're planning on expanding your hotel empire, or even if you're thinking about being President of the United States of America. This mask means huuuuge wins! If you don't have the right look, you're just not going to go very far. Now, we can't help you with the expensive suits or impart on you just how to manipulate the 24-hour news cycle, but we CAN get you that hair that's going to look perfect every time. Look perfect in latex, of course! Hold up some dough and get ready to point to your rally-attendees because you're taking the stage with this wacky Donald mask. It looks just like the guy, albeit with a slightly exaggerated nose, and eyes, and well, everything. There's a strap inside to help keep the oversized mask on your own noggin'. Yup, top off your large and in-charge costume with this Donald mask, and you'll be... well... let's just say it's gonna be HUGE.